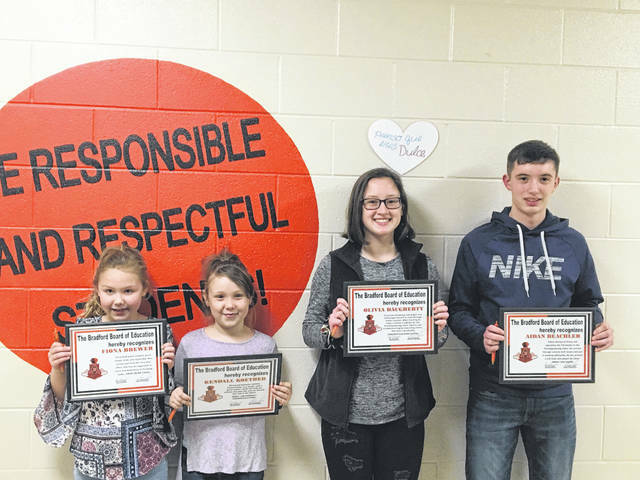 The Bradford Board of Education honored four students during its student spotlight on Monday evening, including (l-r) Fiona Brewer, Kendall Koether, Olivia Daugherty and Aidan Beachler. BRADFORD — The Bradford Board of Education voted its approval to keep its athletic affiliation with a group of schools discussing plans to exit the Cross County Conference during its meeting on Monday evening. Board member Louis Reindel was absent. Those schools verbally announced their plans to leave the CCC during an emergency conference meeting in January, according to previous reports. Newton and Bradford are the only two of the 10 schools located in Miami County, the rest are in Darke and Preble counties. This vote comes one month after the board voted to continue its football program’s involvement in the CCC following the recommendation of the football committee. Also during their meeting, the board honored four students during its student spotlight. Later during its meeting, the board also approved the calendar for the 2019-20 school year and the course of study for 2019-20. Hurst said that 72 percent of the teachers also approved of the school calender that was approved. This entry was tagged athletics, Bradford, Bradford Band Boosters, Bradford Board of Education, CCC, Cross County Conference, Sports. Bookmark the permalink.